If you buy any 3 of my single patterns, you can get 1 extra one for free! Just add all 4 patterns to your basket and check out as normal. Only one offer can be applied per basket. One of my son’s surprise hit presents a few Christmas’ ago was a gingerbread man towelling bath toy. 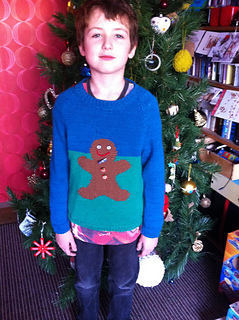 My son loved him and took him to bed with him every night, so it seemed appropriate that I should design and knit a gingerbread man jumper. I named the pattern Can’t Catch Me! after the children’s fairy tale The Gingerbread Man. The Can’t Catch Me! jumper is knitted in pieces from the bottom up; the neckline is knitted on in the round after seaming the shoulders of the jumper. The gingerbread man motif is added using the intarsia technique. The pattern for the intarsia section is provided both as a chart and as written instructions. 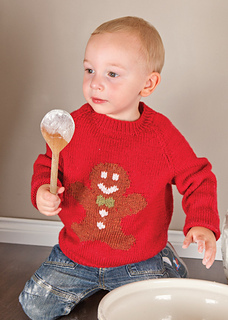 The jumper is knitted in DK weight yarn, making it perfect as a layering piece over the festive season. 2 (4, 6, 8, 10, 12) years, to fit chest sizes 53 cm [20.75 in], 58.5 cm [23 in], 63.5 cm [25 in], 67 cm [26.5 in], 71 cm [28 in], 76 cm [30 in] with 5 cm [2 in] positive ease. Pattern Style: Jumper pattern is written using abbreviations (all abbreviations are given). Both charted and written instructions are provided for the intarsia section.